The perfect simple beach wedding dress in light-weight georgette. Scalloped shoulder straps lined with white beading. Bias-cut sundress design flows with the body's curves. Full back. Scalloped hemline with embroidery and white beads. Fully lined. 100% georgette rayon. Handwash or dryclean. Click on images for closer viewing. 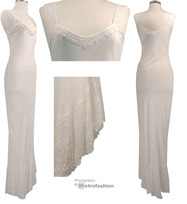 illuna-fashion.com casual bridal wedding dresses, cruise dresses, white ivory honeymoon dresses, chiffon dresses, prom dresses, evening gowns, graduation dresses. Scroll down for secure ordering.